Finn Church Aid implements the basic diaconal mission of the church in cooperation with international organisations and networks, local civil society operators, and Finnish cooperation partners. Finn Church Aid is a founding member of the ACT Alliance, a coalition of operators of church development work, humanitarian aid, and advocacy. It is one of the largest charity organisations in the world and includes over 140 operators in 140 different countries. Its annual budget for relief work, humanitarian aid, and advocacy is 1.5 billion euros. 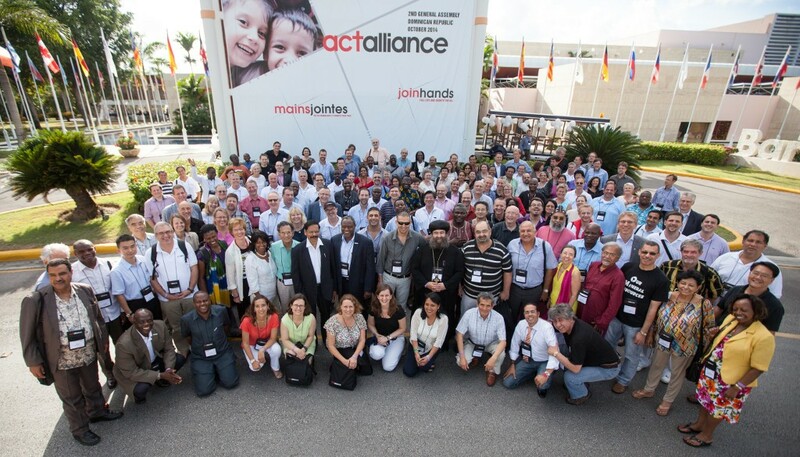 The ACT Alliance has a vital role in the coordination of humanitarian aid by church organisations. In addition FCA is a member of ACT Alliance EU (former APRODEV). It is a joint association of European church aid organisations, and its purpose is to promote the perspective of its member organisations in the development cooperation policies of the EU. The Lutheran World Federation (LWF) is the largest programme implementation partner of Finn Church Aid. We facilitate the long-term development programmes of the LWF in eleven different countries, and the organisation is also a significant partner of FCA in humanitarian aid. Together with LWF we advocate for human rights and inter-religious dialogue at the UN level. We also support disaster preparedness and capacity building projects carried out with the member churches of LWF. Through the World Council of Churches we support programmes that promote peace and facilitate equality and support human rights. We work together with several UN organisations to promote education and peace work, in particular. Among others, these organisations include the Children’s Fund UNICEF, the development programme UNDP, the United Nations High Commissioner for Refugees UNHCR, and the Mediation Support Unit MSU of the UN’s political unit. We are a member of UN’s Global Education Cluster. In addition to this, we have a framework agreement with ECHO, the European Commission’s Humanitarian Aid Department. Finn Church Aid is also a member of VOICE (Voluntary Organisations in Cooperation in Emergencies), a network of European organisations providing humanitarian aid. Furthermore, Finn Church Aid has a growing number of local, bilateral partners. Local partners are churches, church organisations, other religious organisations, and other civil society operators. They are experts in their own operational environments and help us to achieve sustainable results. As a member of HAP International we are committed to developing our operations in a responsible, high-quality manner in regard to all our interest groups, paying special attention to those with and for whom we work. We work closely with the dioceses and parishes as well as the Common Responsibility Campaign. We are also a member of the Finnish Ecumenical Council. Finn Church Aid is a partner organisation of the Ministry for Foreign Affairs of Finland. In Finland, Finn Church Aid is a member of, among others, the Service Centre of Development Cooperation Kepa, the umbrella organisation for Finnish civil society organisations, and Kehys, the national platform of CONCORD, the European federation of non-governmental relief and development organisations. We are a member of the following organisations and networks: The Development Policy Committee, the Finnish NGO Foundation for Human Rights (KIOS), Civil Society Conflict Prevention Network (KATU), Human Rights Advisory Board (IONK), FinnWatch, Finnish Somalia Network and Fairtrade Finland. We’re also member of the Friday Group that consists of NGO representatives, Members of Parliament and officials from various ministries. The group advocates for the importance of social, health and human development in the development policies of Finland and the European Union. We are also one of the partners of the Red Nose Campaign in Finland.